Sean gave me a “get well” note of sorts today, to help me through this difficult transition. 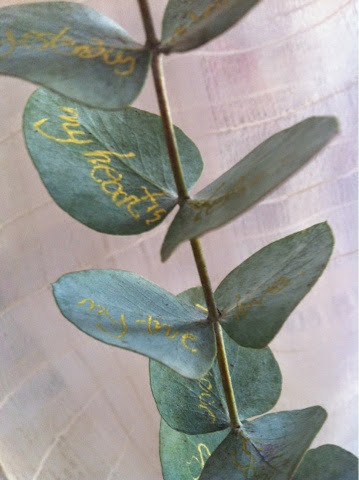 The note is written on leaves of a Eucalyptus wand, known for its healing properties. 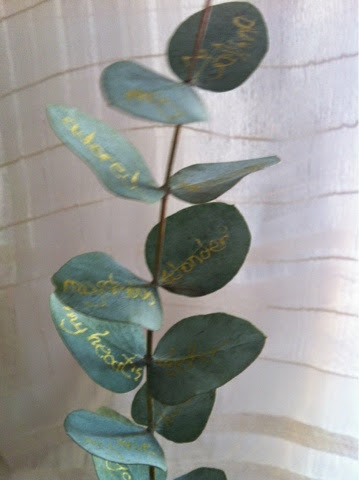 It’s hanging above my bed now twirling in the breeze from the garden. I used a silk scarf as a photographic backdrop for my eucalyptus wand. Sean wove this scarf on a loom, each ephemeral wisp of thread bent to his aesthetic sense. He hung several numinous scarves on a wall for his textiles exhibition at the Royal Academy of Art in London. Ghosts must be woven from filaments in the same fashion; spun from cocoons underground, then woven by an infinitely patient hand. I imagine spinning wheels and looms appearing in graveyards – artisans working magic by moonlight, spinning skeins from the mouths of stilled bodies, and weaving their spirits. I need a shroud like that now, permission to be invisible, with a crown of eucalyptus on my head that seems to float in thin air. Crowned with kind words. This is a very hard time for me. The pain is a ghost that took twenty years to weave. I didn’t see it, even though it must have sat in the living room with my husband and me while we discussed the next twenty years together, even as we laughed, or cuddled, and spoke of dying together. I didn’t see the ghost. It was woven so slowly. Its cocoon was so silent and still. My marriage has a ghost now. Sean said, “You have to be more kind to yourself. The whole world is lined up to beat you down, to beat anyone down. You don’t need to help them. 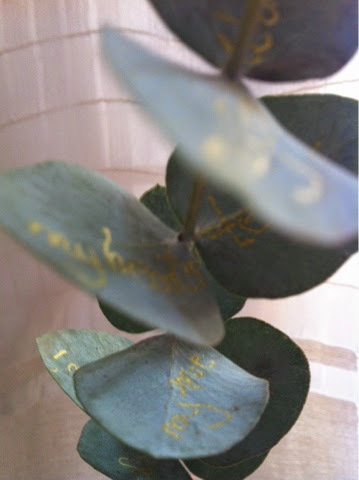 Use my words on the eucalyptus to beat off the bad words.” Even the bad words I’ve imagined, or the ones I fear,or the ones that exist only in memory, or conjecture and speculation. The bad words that wake me up panicking at 2 am. Bad words beaten with a healing wand, edited with gold ink. That is what I will do. I will rewrite the world in gold. Next Post Come Slowly, Eden!